In 1870, lumber baron Conrad Bohn built his elegant Winona home along with its grand three-story carriage house. Today, hosts Deb and Don Salyards have restored the Carriage House, complete with four guest rooms, as a pleasant reminder of a bygone era. All guest rooms have private baths, each with their own special charm. The Carriage House is a smoke-free facility. Located in the heart of historic Winona, Minnesota (pop. 25,000) the Carriage House Bed & Breakfast is a short walk from the banks of the Mississippi river and is in the shadow of the valley's majestic 600 foot bluffs. All four rooms have private baths. The Friendship room is a two-room suite that was originally a stable boy's quarters. This room is complete with antique style Queen bed, a separate twin sized sleigh bed, a gas fireplace (seasonal), two person Jacuzzi whirlpool bath and separate shower $149. The Toy Room is another stable boy's room with antique toys and queen sized bed $80. The Bohn room has a queen sized four poster bed and a gas fireplace (seasonal) $90. The Village Loft has a queen sized bed, gas fireplace (seasonal) and a two person Jacuzzi whirlpool bath, with separate shower $139. Dedicated fax and modem lines are in place for business travelers. 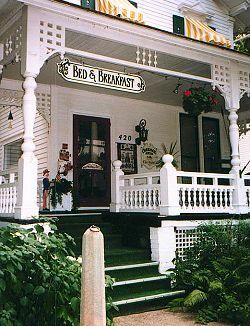 This and other Winona Bed and Breakfast Inns can be found here in The Register.